The Government is continuing to provide funding for the academic year of 2018/2019 to provide substantial primary school sport funding. This funding is being jointly provided by the Departments for Education, Health and Culture, Media and Sport, and sees money going directly to primary schools to spend on improving the quality of sport and PE for all their children. Schools have to spend the sport funding on improving their provision of PE and sport but they will have the freedom to choose how they do this. How we are spending the Sports Funding and who benefits? The Governors agree that the money must be used so that: all children benefit regardless of sporting ability, that staff have access to working alongside specialists and have opportunities for training, that there are a greater variety of extracurricular opportunities for PE/sport, that a high proportion of children are given opportunities to compete in tournaments and competitions and that swimming is continued to be offered to all children. The table below shows how we are spending the sports funding during 2018/2019. This year our school received £19000 Sports Funding. Employing a dedicated PE teacher for four afternoons a week. Our dedicated PE teacher oversees PE in school and coordinates all of the clubs and competitions. She selects and trains children for these competitions. She creates opportunities for more children to participate in sport in school by organising inter – class and inter-school friendly competitions as well as Level 1, 2and 3 inter school competitions. She has overarching responsibility for all of the PE teaching and teachers in school and for the clubs. She identifies gifted and talented pupils in sport and keeps a record of their achievements both inside and outside of school. Our school has always offered a variety of sports clubs. This year there will be six sports clubs a week after school which will change depending on the season and the competition schedule. There will also be lunchtime sporting clubs for children. 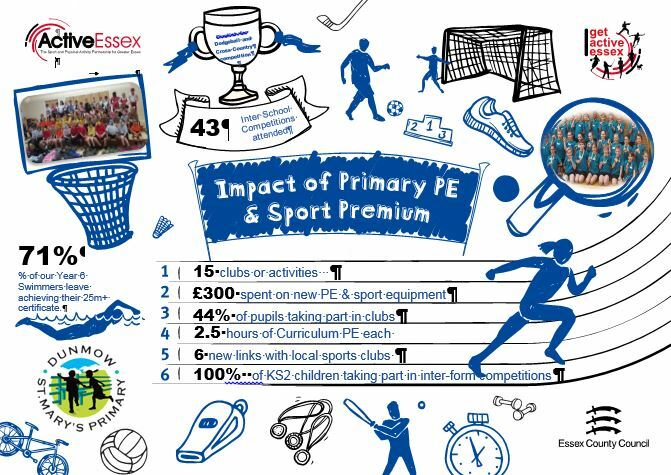 Last year 45% of KS2 children and 42% of KS1 children attended at least one extracurricular sports club. KS1- Gymnastics, Dance, Multi skills and Rounders. KS2- Gymnastics, Dance, Multi skills, Rugby, Football (boys and girls), Hockey, Netball, Rounders, Athletics, Tennis. Our consortium of local primary schools have employed the services of a school’s sport co-ordinator. He not only delivers in school training for staff but sports sessions for pupils. He also co-ordinates many of the local competitions so that more children can compete. KS2- Football, Dodgeball, X Country, Archery, Sports Hall Athletics, Swimming, Hockey, Tag Rugby, Gymnastics, High 5 Netball, Tennis, Rapid Fire and Quick Cricket, Rounders, Tri Golf, Athletics. Children were also able to create and present multi skills activities for a KS1 multi skills afternoon. 83% of KS2 children and 59% of KS1 children represented the school in at least one competition in 2017/2018 This is an increase in KS2 from 52% last year. KS1 has remained the same. A member of staff is paid to co-ordinate and organise the Playleader scheme. These playleaders lead other children in games and support them with ball and skipping skills. Although parents are asked for a contribution towards swimming these lessons are subsidised by the school so that every child can swim in the summer term rather than the children stopping once they can swim 25m which is the national Curriculum requirement. We run our swimming pool at a loss every year. We intend to add £1000 of our sports premium funding to make up the shortfall. We regularly use the community mini bus but sometimes have to hire coaches to competitions. We intend to use £1500 of our sports premium funding towards this transport cost. We intend to hold coaching courses in school for teachers and to send teachers to coaching courses to increase their skills. We have put aside £1000 to cover the cost of these courses.